Kelly and Simon are Fun In the Sun Weddings’ newest newlyweds! 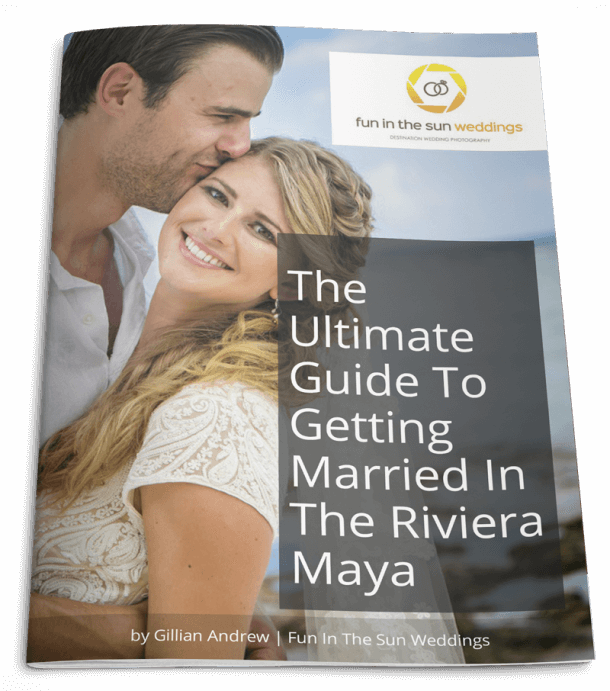 It was a random spin of the globe that led to this bride and groom choosing to get married on the beach in Playa del Carmen, Mexico. Kelly is from Scotland, and Simon is from New Zealand, but they met in Sydney, Australia at a party. Kelly had just moved to Oz and Simon was the very first boy she met there. The bride had always wanted to get married on a private beach. 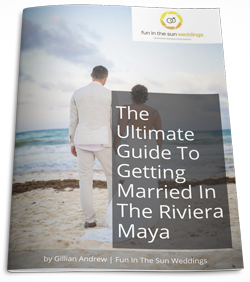 With family and friends coming from around the world, they literally just spun the globe and chose to have a destination wedding in the Mayan Riviera of Mexico. It was an area they had never visited before and that made it more exciting! Their wedding day vision was for everyone to have fun, and thanks to their wedding planner, Sofia Garcia, this is exactly what they got at the Blue Venado Club. The bride tells us that she wishes she could relive every moment of it again. Kelly and Simon chose to have a traditional handfasting ceremony to symbolize their connection and devotion to each other. The ritual was led by Anna at Riviera Maya Officiant. What advice does Kelly have for the bride-to-be who is getting married on the beach? Don’t worry about the tiny details of the day. Everyone is there for you and your Hubby-To-Be. Just enjoy it and have fun as it will fly by so fast! Kelly and Simon, you have been such a treat to work with, and we wish you all the happiness in the world as you start this new life together. We hope you will find your way back to us soon. Congratulations! Want to know more about Blue Venado Beach Club? Read unbiased reviews on Tripadvisor here. Marc was fantastic! He really is so good at making everyone happy and comfortable in front of the camera.